As any doctor might tell you, the most important step in the treatment of a disease is its correct diagnosis so that a good resolution is more likely. 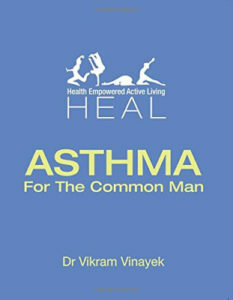 ‘Asthma for the Common Man’ has been written with the same notion in mind. It explores the illness in and out and describes the necessary precautions. This small handbook (guide) explains the meaning, causes, risks and treatment options for Asthma. The author has presented each and every detail in such a manner that even a layman can understand the basics. Since book deals with the various allergens, prevention of the acute condition, handy measures during an emergency and the correct diagnosis procedure, it proves out to be a good self-help book. Small and pocket-sized, it is easy to read and understand. Readers can definitely learn how to deal with asthmatic children (even adults) in a vulnerable environment and provide first aid.